There is just so much to see in Athens that you will easily occupy yourself by exploring all of the city's ancient attractions, checking out the Dionysos Theatre and of course, visiting the famous Acropolis. However, if you have time for some additional sightseeing outside of the confines of the city, then various day trips are possible. Cruises regularly depart from the port suburb of Piraeus and take in numerous neighbouring Greek islands, while the seaside suburb of Faliro may also appeal, being just 8 km / 5 miles to the south-west of central Athens and home to the multi-use sports arena named the Peace and Friendship Stadium (Stadio Eirinis kai Filias). 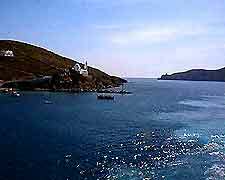 Further attractions warranting excursions include Agora, the Amphiaraion Archaeological Site at Kalamos, the Chapel of our Lady of the Cavern at Plako, and the beautiful Anafiotika area, located on the north-easterly side of the Acropolis hill. If you enjoy the sunshine, then the golden sands of Schinias Beach may well beckon. 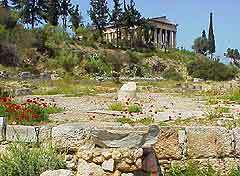 Famous for its markets, Agora was once the centre for business and political life in Athens, many years ago. Highlights include the Agora Museum, with a model of ancient Agora and many well-preserved artefacts, the foundations of the Stoa of Zeus Eleutherios, where Socrates once addressed crowds of people, and the 5th-century Temple of Hephaestus, which dates from 449 BC and is one of the best-preserved temples in Greece. This is one of the most romantic spots in Greece and highlights include 6th-century architecture, an ancient theatre, wonderful views and nearby mountains covered in pine trees. The Amphiaraion Archaeological Site in Kalamos is an hour's drive from the centre of Athens and is also close to Marathon, as well as Agii Apostoli's pleasant pebble beach. Close to the Theatre of Dionysos is Panagia Hrysospiliotissa, a small an interesting temple hidden in the side of a cliff face. 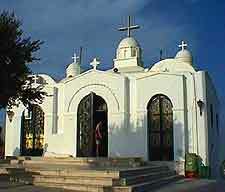 There is a rocky path leading to this 'Chapel of our Lady of the Cavern' and ancient pictures on the walls. 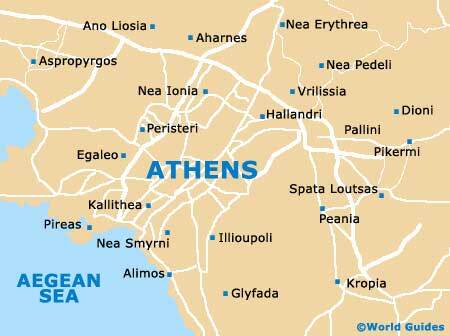 Cruises from Athens are available and take in the sites of nearby islands and attractions. Olympic Short Cruises depart from the Marina Flisvos in the area of Faliro and last an entire day. Those visiting the islands of Aegina, Poros and Hydra will be pleased to find that the price includes lunch, which is served on the boat. The Attica Peninsula is less than one hour from the centre of Athens and provides visitors with many attractions, including the renowned Schinias Beach - a stunning Greek beach offering some wonderful bathing, a coastal pine forest and exceptional views. There are also many excellent tavernas, serving traditional Greek cuisine for tourists. Schinias Beach can be easily reached by bus, departing from Mavromateon Street. The Anafiotika district of Athens is without doubt one of the most beautiful parts of the city. With many small white houses and a maze of winding pathways and streets, highlights include numerous renovated neo-classical houses and buildings, the church of Agios Georgios (St. George of the Rock), which was built in the 17th century, and a museum, housed in the old university of Athens. Close to the town of Peania and 4 km / 2.5 miles outside of Athens, Koutouki Cave is one of the most beautiful in Europe, with some enormous stalactites hanging from the ceiling. These wonderful caves were discovered purely by accident several years ago, when a shepherd's goat fell through a hole in the cave's roof. Guided tours leave every 30 minutes.